Earlier this week, the UFC fined middleweight king Anderson Silva (pictured) a whopping $50,000 for skipping a media tour with some of Los Angeles’ largest press outlets. Silva has a simple explanation for bouncing from his pre-fight promotional duties in order to board a plane bound for his homeland of Brazil – he didn’t know about Tuesday’s media junket. “I never missed any commitment to the UFC,” Silva told Brazilian website Veja (via Google Translate). “I never make a trip to Brazil if I knew I should be in Los Angeles. Everyone knows that I always lock my media schedule to devote myself to training, that is my priority. Silva did not mention if he intends to protest the hefty financial hit. However, I’m not quite sure his excuse will fly with UFC president Dana White, who imposed the penalty. “The Spider” defends his throne against Chris Weidman at UFC 162. Silva’s no-show didn’t sit well with Weidman, who told MMAFighting that he had to make the cross-country flight from New York to LA and “wasted [three days] during my camp” to promote their July 6 fight. This isn’t the first time Silva has refused to engage the media leading up to a scrap. 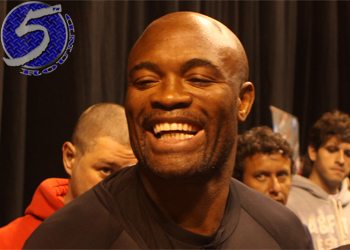 Before beating Chael Sonnen at UFC 117, Silva said next to nothing during a conference call. UFC 162 takes place inside MGM Grand Garden Arena in Las Vegas, Nevada.